We offer five variations of thread-on muzzle suppressors for the .22 Rimfire, and one for the .17 HMR. All are threaded 1/2″-28 as standard, while other threads may be possible. 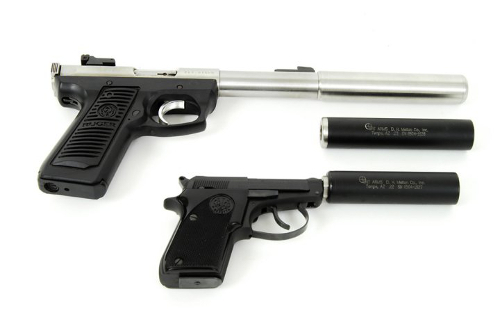 CHEYENNE – An all-aluminum suppressor except for the stainless steel rear cap where threads are. With a 1-inch O.D., the suppressor is 4.8″ long and weighs 3.3 ounces and reduces sound by approximately 35-41 dB with Remington subsonic ammunition. (This depends on the host gun’s barrel length. 116-117 average dB absolute readings were recorded on a 5″ barrel pistol). Color is black GunKote. CHEYENNE XL – Just like the Cheyenne, except it incorporates one more baffle and is 5.4″ long. This is the quietest production suppressor currently available in its size class (under 6″ long). CHEYENNE XXL – A step above the Cheyenne XL: the XXL has one more baffle than the Cheyenne XL. Measuring 6.2″ long, it is approximately 2 dB quieter than the Cheyenne XL. You will not find a quieter .22 suppressor than the Cheyenne XXL if you don’t mind the extra length. 22 ODESSA – Similar to the Cheyenne yet only 3.90″ long. 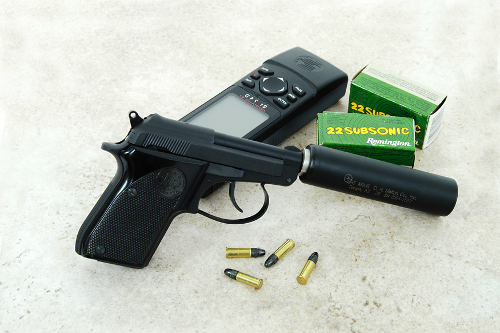 It delivers up to 34 dB of dry sound reduction on a Beretta 21A. The ODESSA is the perfect suppressor when size is of importance; this tiny suppressor outperforms many other competing products that are 2-3″ longer. APACHE – Features all-stainless steel tube and end caps with aluminum internals. 1″ O.D. by 5.0″ long, this can provides 36-42 dB of sound suppression using Remington subsonic ammo. Color is a polished stainless finish. ION – This is an all-stainless steel unit designed specifically for .22RF and .17 HMR submachine gun use, particularly the American 180, Vector UZI .22, and M-16 .22LR conversions. 1″ O.D., by 6.4″ long, the ION may be completely disassembled by the user for cleaning and maintenance. This is an important consideration considering how quickly a sealed unit can become clogged with vaporized lead from full-auto fire. The Ion is an improved version of the discontinued Comanche. Price includes a disassembly wrench on the Ion only. A separate alignment stand that holds the ION upright and guarantees baffle alignment during reassembly is available for an addition $20. dB reductions on the ION suppressor ranges from 39-41 dB depending on ammo and the host gun. Color is bright stainless, and; a black Cerakote finish is available for an extra $20. Apache (top), Cheyenne (middle), Odessa (bottom).